Something a bit different this time around, AndroidGuys – rather than comparing last year’s model to this year’s, I’m going to pit two high-end juggernauts against one another. I’m not gonna lie, I’m biased in this particular Showdown. I think the Edge’s curved screen and edge gestures are over hyped and faddy, like 3DTV and Pogs, and will pass as swiftly as it arrived. I like the V20’s adorable little second screen, despite it being ill-placed and underutilized. I mean, wouldn’t it be more useful at the bottom of the screen, where it can be easily reached with even the Megan Foxiest of thumbs? Wouldn’t a long, thin bar of a screen be better utilized if it doubled as the navbar for Android? When the main screen is off, it could be used a notification ticker. When on, it could be used as the navbar, or a horizontal swipe could take you to the app dock. Hell, they could even have made it AMOLED to make it more battery efficient. And I’ve gotten sidetracked again. Anyway. Here’s the Showdown. Not exactly Apples to Apples, here; the S7 Edge is smaller and lighter with a glass body and aluminum frame, while the V20 is larger and heavier with an aluminum body. Rest assured, being flagships of two of the biggest, baddest manufacturers around, both are gof solid build quality. Gotta admit – it sure is pretty. This is kind of a toss-up for me. On the one hand, I love AMOLED screens. Those deep blacks are gorgeous, and the battery life is really improved. On the other, I deeply dislike the Edge’s curved screen and love the V20’s secondary display; so I’m gonna call this a draw, because I’m indecisive. 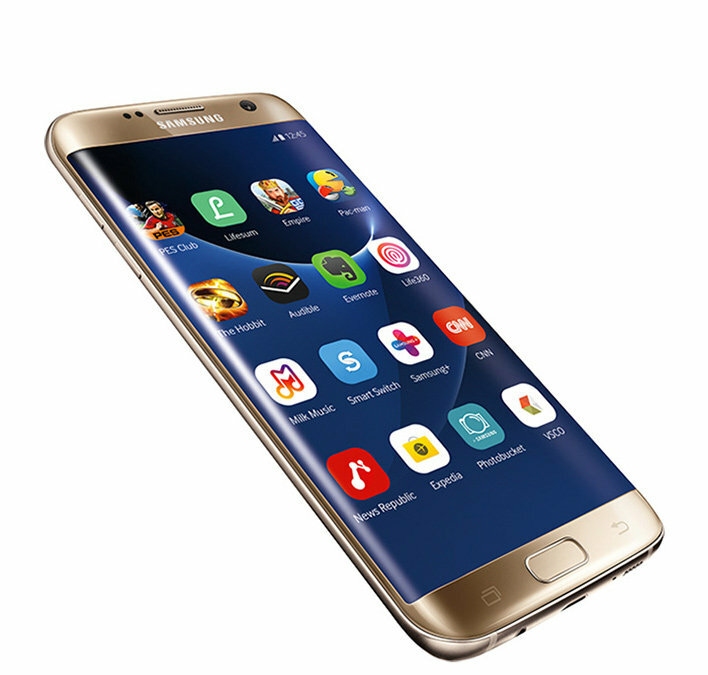 Objectively, however, the S7 Edge has a denser screen with a more unique technology associated with it – it’s also a bit smaller, for those of you with smaller hands. Relatively comparable, here; though the S7 Edge technically has an advantage in the processor department, the V20 actually comes in with a slightly higher AnTuTu score (135k vs the Edge’s 128k). The V20 comes with 64GB stock internal storage, though both devices have a microSD slot – so storage should never be a problem. Let’s be honest – that last one is the one that matters. Both features use a gimmicky technology to display relevant information with the primary display off, though they use very different functionalities to deliver said information. The Edge makes great use of its AMOLED screen by ensuring that only the pixels that are being used are turned on, and the curved screen means that even if the phone is face down, the notification will be visible. In addition, Edge gestures allow a variety of functionalities – that, honestly, can be accomplished with a traditional flat display. LG’s solution is a little more…hamfisted. It uses a secondary display to show relevant information and notifications when the primary display is off, as well as providing a place for app shortcuts – kinda like a permanent App Dock you’d find on your homescreen. This second screen, however, is not AMOLED, meaning that whenever it’s on, it’s draining battery – even with a solid black background. In addition, it’s not viewable when the phone is face down. It really comes down to technology preference – I prefer the second display over the gimmicky, hyped-up curved screen, but I wouldn’t fault you for reversing the adjectives there if you so wished. While PhoneArena doesn’t have specific talk times for the S7 Edge – the V20 is rated for 8 hours of talk time – I’m inclined to believe that with a smaller, more efficient screen and a more diversified CPU, the Edge is likely to get more out of a comparable size battery – let alone one that’s 400mAh larger. It should also be noted that the S7 Edge supports Wireless Charging (including the Qi standard), while the V20 does not. As I noted in my last Showdown, the V20’s camera is (well, are) a beast. Even at first glance (12mp vs 16mp, 1.7 vs 1.8/2.4 aperture) the V20 tramples all over the S7 Edge, and that’s without taking into account that the V20 has two separate lenses, a near-human FoV, and a camcorder that’s specifically intended to record crystal clear video and sound. LG really outdid itself here (to be fair, the S7 Edge also came out 6 months earlier than did the V20). I was honestly a bit surprised by this; I thought for sure that after six months the S7 Edge would be a bit cheaper, but I guess I should have expected that it’d retain value well – and probably will continue to do so until the S8 is released. Given the obvious camera advantage, larger stock storage, Type C charging port, and second display, I actually think the V20 might be worth a buy over the S7 Edge – at least for the next few months. Obsessive Tech and Sacramento Kings fanatic. Snarky and prone to random, lengthy asides. Contributor for AndroidGuys.com.